Lower Saxony (Niedersachsen) is Germany’s second largest state, stretching from the North Sea to the Harz Mountains. Close to 8 million Germans call this state their home, and every year millions of tourists flock to the beaches and islands along the state’s North Sea coast to seek rest and recreation. The seven inhabited East Frisian islands (Borkum, Juist, Norderney, Baltrum, Langeook, Spiekeroog, Wangerooge) are the main tourist destinations. Other popular locations in Lower Saxony include the Wattenmeer, which is the vast coastal area of wetlands, salt marshes and dunes, as well as Germany’s oldest nature park, Lüneburger Heide, a serene heathland and dotted with herds of an old breed of sheep called Heidschnucken. The Steinhude Lake Nature Reserve offers great scenic diversity and a wide range of water sports on the largest lake in northwest Germany. The idyllic forests of the Harz Mountains also enjoy great popularity among nature lovers and hikers. Lower Saxony’s capital Hanover looks back on a long history as a city of international importance. The sphere of influence of the Royal House of Hanover was greatest between 1714 and 1837 when Hanover’s rulers also acted as kings of England. Today the city enjoys a great reputation as one of the major trade fair hubs. In 2000, Hanover Fair hosted the World Exposition EXPO2000. Each year in spring, Hanover Fair hosts CeBIT, the largest annual IT trade show. Another modern tourist attraction and a must-see for the serious German car enthusiast is “Autostadt.” This combination of museum, theme park and customer service center is conveniently located near the Volkswagen manufacturing plant near the city of Wolfsburg. The city of Göttingen is Lower Saxony’s academic center and home to Georgia Augusta University which was founded in 1734. This prestigious university counts more than 40 Nobel Prize winners among its alumni and faculty. Lower Saxony’s meat industry is an important sector of the state’s economy, with businesses from smaller family-owned companies to large meat processing facilities. Some of the brands available in the US originate in Lower Saxony, such as Abraham hams and Meica sausages. Farmers in Lower Saxony grow a wide variety of crops, chief among them sugar beets and various grains in the state’s Southern part. The sandy ground of the Lüneburg heathlands provides perfect soil for asparagus and potatoes and the coastal area is one of Germany’s prime cattle-raising regions but is also known for its fruit orchards. The quintessential crop of Germany’s Northeast, however, remains kale (Grünkohl or Braunkohl). As is true for many German states and regions, Lower Saxony boasts of a great wealth of local lore and legends, some of which have become known all over the world. The following is but a glimpse into this fascinating world where history, folklore and storytelling meet. The story of the Pied Piper is known the world over and is said to have taken place in the year 1284 in the town of Hamelin (Hameln in German). This picturesque city situated along the river Weser had become prosperous thanks to the grain trade but had fallen prey to a plague of rats. When a strange man appeared one day who promised to get rid of the rodents, the townsmen quickly struck a deal with him. Using his pipe-playing skills the stranger lured away the rats and caused them to drown in the river. The deal went sour, however, when the town refused to honor their promise. To teach the people of Hamelin a lesson the Pied Piper took with him the town’s most precious resource, the children and thus its future. While there is evidence that parts of the story of the Pied Piper are rooted in historical events, the character itself seems to be legend. The tall tales surrounding a character named Baron Münchausen are based on a real person who was born in Lower Saxony (Bodenwerde) in 1720. Hieronymus Karl Friedrich von Münchhausen was a self-declared adventurer and daredevil. After reportedly fighting in several wars, he retired at the young age of 30 and resorted to storytelling and hunting. The 1780s saw the publication of increasingly exaggerated stories and anecdotes about his life in both English and German. Another famous Lower Saxon is the German poet, artist and satirist Wilhelm Busch (1832-1908) whose widely popular illustrated stories make him one of the founding fathers of the genre of satirical comic strips and cartoons. Max & Moritz, one of his first illustrated stories, was published in 1865, became a huge success and is still popular today. These severely moralistic tales about two trouble-making boys had a direct influence on the American comic strip. Food and drink played a significant role in Wilhelm Busch’s life as well as in his work. Busch was the eldest of seven children born into a family of modest means. Their father was a grocer in the village of Wiedensahl near Hanover. A life-long bachelor, Wilhelm Busch usually lived on simple fair, bread and sausages mostly, but was very appreciative of cooking skills and culinary specialties. He dedicated rhymes or even entire poems to food and its preparation. Lower Saxony is well-known for its gourmet food and culinary delicacies. 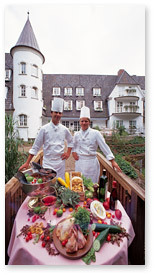 The culinary range of Niedersachsen’s regions offers something to please every palate – from traditional rustic dishes like roast mutton from the heath region, hearty cheese from the Harz mountains or kale with Pinkel sausage to delicious fresh asparagus or a vast variety of prawns, shellfish and fresh fish along the coast. Every region has its own characteristic specialties and flavors. 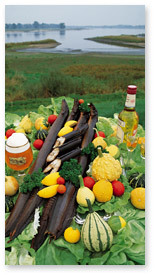 Following is only a small sample of the culinary treasures Lower Saxony offers. A product presented at the 1893 World Exhibition in Chicago was to become one of Germany’s most well-known branded food products — the Leibniz Keks. The entrepreneurial muse took hold of Hermann Bahlsen when he was working in the sugar trade in Great Britain. He returned to Germany, more precisely to Hanover and, in 1889, founded the “Hannoversche Cakesfabrik H. Bahlsen.” Two years later, he came up with a new type of butter cookie which he christened “Leibniz cakes” in 1892 in honor of Hanover’s best-known son, the brilliant philosopher Gottfried Wilhelm Leibniz (1646-1716). From the outset Bahlsen was thinking globally and granted licenses in North America and Moscow early on. He proved to be a pioneer for the food industry in many other ways. Whereas his competitors were still selling their products unwrapped, in 1898 Hermann Bahlsen started packaging his product in airtight bags and from 1904 onward the company used a box to protect its popular cookie product from moisture and other detrimental factors. This innovation allowed the rectangular Leibniz cookie with its distinctive jagged edge to remain neat, crisp and easy to carry. The product soon became commonly known as “Reisekeks” (travel cookie). In 1905 Bahlsen’s pioneering spirit again got the better of him when Bahlsen was among the first manufacturers in Europe to use conveyor belts to expedite the packaging of his baked goods. Hermann Bahlsen’s creative business idea to use the English word ‘cakes’ to describe his cookies quickly became part of everyday language. Over time the word was Germanized to “Keks” which was officially adopted into standard German when the word made it into the 1911 edition of the prestigious DUDEN dictionary. Though many companies have tried to imitate Bahlsen’s butter cookie, the Leibniz cookie remains virtually unchallenged as the quintessential cookie in its category. The cookie owes its unrivaled fame to the quality of the original recipe and the company’s masterful marketing. Today the company exports its baked goods to more than 80 countries all over the world. Leibniz cookies are a main ingredient in a classic German party recipe known as “Kalter Hund” (cold dog) or “Kalte Schnauze” (cold snout). Let two students of German show you how to make this dish which looks like a cake but does not require any baking in their lighthearted video. While coffee is the number one hot beverage of choice in most of Germany, tea reigns supreme in East Frisia, the country’s extreme Northwestern corner. The inhabitants of this sparsely populated corner (Ostfriesen) consume a whopping quarter of all German tea imports, and rival the per capita consumption in the tea nation Britain. In fact, historically, East Frisian tea culture precedes the British custom of tea time by some decades. Following the arrival of the first shipment of tea to Europe in 1610, it took some time for the new drink to gain some ground since beer was consumed with any and all meals, even breakfast. The arrival of tea and coffee changed this, with poorer people preferring the more economical beverage of tea over coffee. Black tea was usually chosen over the more pricey green tea for the same reason. Tea soon became the preferred beverage to be consumed at all times of day, usually served with plenty of sugar which provided the necessary calories. Black tea also had the advantage that the leaves could be used to brew several pots of tea, again in an effort to get the most out of it. Exception has always been made for guests, of course, who always should be served the first pouring of freshly made tea. To this day, strong black tea is served to visitors of an East Frisian home or gathering. The traditional preparation of East Frisian tea is a well-defined ritual: First a piece of rock candy sugar called Kluntjes is placed in typically small cups made from delicate China (the traditional East Frisian decoration is a specific rose design). The freshly brewed hot tea (steeped for at least three minutes) is then poured on top of the sugar which produces a distinct crackling sound. The rock sugar will melt slowly which allows multiple cups to be sweetened with the same piece. In a last step spoon of heavy cream is added by letting it drip slowly from the spoon to the wall o the cup. The cream then sinks to the bottom of the cup only to form a cloud on the surface. The most important rule is to never stir the tea which produces three layers of flavor. First you will predominantly taste the cream, then the tea will unfold its flavor and with the Kluntje at the bottom of the cup providing a sweet finish. Tea in East Frisia is usually served with small cookies or slices of cake as a special treat on weekends or special occasions. Grünkohl mit Pinkel, sometimes also called Braunkohl mit Pinkel (especially in the area around Bremen) is a beloved dish among Northern Germans. It is a hearty stew made from kale, smoked sausages called Pinkel and other pork products. Kale made its way to Northern Germany from the Mediterranean and has since become a staple few Northerners could do without. Kale is best harvested after some days of frost which helps turn the plant’s starch to sugar, giving the dish a subtle sweet flavor. This robust stew requires a slow cooking process with several hours of simmering time. People in the region between the rivers Ems and Elbe long for kale season which lasts roughly from November to March. During this season it is a much-observed custom among friends, family and work mates to go on kale outings which usually involve a long, brisk walk to the local restaurant of choice. The oddly sounding Pinkel is a smoked sausage made with pork, groats (oats and barley), suet, onions, salt, pepper, pork fat, bacon and other spices. The casing is traditionally taken from the end of a cow’s large intestine, which is also referred to as Pinkel. The exact recipe differs from sausage maker to sausage maker, who keep their individual recipes secret! The German stew recipe also usually calls for a type of scalded sausage (Kochmettwurst) and a specific kind of cured smoked pork (Kassler). Since it is hard to find the exact equivalent meat products in North America, we have adapted the recipe to reflect ingredients which are more commonly available in supermarkets and gourmet grocery stores. In our store generator you may be able to find local delis which might carry some of these special German meat products. While smoking meat and fish has been used for ages as a form of conservation, today this curing method is mostly used for the sake of flavor. The freshly caught fish are gutted, washed and cleaned. In a next step the fish is salted thoroughly, spices and herbs are sometimes used at this stage. After rinsing them again the first step in the smoking process involves high heat for a brief period to ensure that any parasites are destroyed and to start the curing process. The next step establishes two basic methods of smoking used in Germany for curing fish or meat. Cold smoking is the older and bz far more time-consuming process which takes two to four days and uses temperatures not to exceed 30° C (86° F). The method of hot smoking is much more widespread and takes temperatures of over 60° C (140° F) and a curing tie anywhere from several minutes to two hours. The area best-known for its smoked eel is the region around Lower Saxony’s biggest lakes, Steinhuder Meer and Zwischenahner Meer. Freshly smoked eels are best enjoyed with a small glass of Korn. Cheese from the mountainous Harz region (Harzer Käse, Harzer Roller) is one of the oldest types of cheese. It is made from sour milk and the majority is left plain, producing a golden yellow cheese strong in odor and pungent in flavor. Other popular varieties of this local cheese specialty involve treatment with mold cultures (Schimmelkäse with its characteristic white coating) or the addition of caraway (Kümmel) to the cheese’s outer layer. Traditionally, Harzer cheese was made at home in small batches and shaped by hand, hence the names Bauernhandkäse (farmer’s hand cheese) or simply Handkäse (hand cheese). Harzer cheese is naturally low in fat (below 1%), high in protein (about 30 %) and contains important minerals and vitamins. Traditionally the cheese is served with dark wholegrain bread or “mit Musik” (with music) which in the Harz region means in a dressing of oil, vinegar, onions and pepper. The distillation of grain-based spirits began in the 15th century, with the first written record of this tradition dating from 1507. The popularity of this powerful beverage spread so quickly that it became necessary to contain the distillation of grains in times of famine. A comparatively young purity law from 1909 decrees that Korn only be made from pure wheat, buckwheat, rye, barley or oats. The only other ingredients used in the production are malt and yeast for the fermentation process. By distilling it twice the result is a refined spirit, which is then diluted with water to the desired strength — 32 vol. % for regular-strength Korn, 38% for Doppelkorn. Grain spirits which have been allowed to mature in wooden casks for six months or longer may be called Edelkorn or Altkorn. The ideal way of enjoying Korn is at a temperature slighltly above freezing and the preferred drinking method among grain spirit aficionados is to sip it slowly. Lüttje Lage is the name of a drink that involves Korn and a small glass of beer which are supposed to be consumed simultaneously by holding both glasses in the same hand and by pouring their contents into one’s mouth in one single movement. Even though beer is commonly associated with Bavaria and its iconic Hofbräuhaus in Munich, the ubiquitous German beverage originated in Lower Saxony. The small town of Einbeck in the Southern part of the state is proud of its long tradition of beer brewing which goes back over 600 years. A treasured document from these early days of the brewing tradition is the oldest surviving receipt for beer which records the purchase of two tons of beer by the Duke of Saxony and Lüneburg and is dated 1378. As early as the end of the 15th century, the town’s beer brewing fame had spread far and the brewers started exporting their celebrated beverage via the Hanseatic port cities of Lübeck and Hamburg to Amsterdam and Utrecht and as far as Riga and Stockholml. In the mid-1500s the dukes in Munich started enjoying the alcoholic beverage brought in from the North. In 1612 the newly constructed Hofbräuhaus recruited a master brewer from Einbeck who brought with him the Lower Saxon recipe for beer.